Browse:Home pl.delfi.lt PL DELFI established an amazing record – over 100 000 readers! 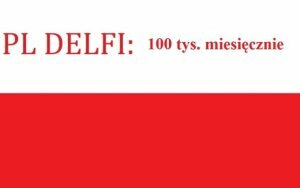 PL DELFI established an amazing record – over 100 000 readers! The top Polish web portal in Lithuania has been visited by over 100 000 users for the first time. In October and November, the number of unique users reached over 109 000 and 116 000 subsequently. In September the portal managed to reach the result from March, which has been the best month in the history of PL DELFI so far. After the decrease reported in the summer months, the number of readers increased by over 70%. Moreover, October turned out to be even a better month. For the first time the polish web portal exceeded the number of 100 000 unique users. To be more specific, the counter stopped at 109 335 users, what means the increase by 38,17% in comparison with September. Ignoring fierce and intense criticism from the counter-ideological portals, PL DELFI not only maintains the considerable number of regular readers, but also gains more and more interest among the Internet users. The result from November confirms this tendency – the number of unique visitors has stood at 116 910 – so this means the further increase by 5 – 6 % in comparison with the previous month. It is worth highlighting that PL DELFI achieved the best result among all websites belonging to the DELFI group. The average daily result of unique views is also promising. PL DELFI is usually visited by about 5 600 users a day. The portal has also published a table presenting the participation of visitors from other countries. The table is available in the last picture attached to the source article.